Morgan Llwyelyn and Michael Scott are known for their historical fantasy. They tend to explore places in history where there is a cultural shifting. It is an anthropological principle that in this kind of shifting of cultures myths arise. So the tales touch on the edges of myths that we still know today. 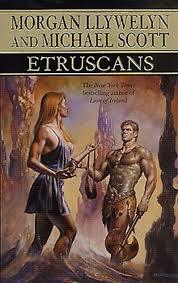 The Etruscans is not as successful an adventure as some of their other work. This is a period where our archeology is limited and our understanding even more limited. The story itself is a rambling tale that includes characters and myths from all across the Mediterranean. There are scenes that suggest the possibility of small Neanderthal tribes still living in the Italian hills. There is a secondary character who is an Egyptian priest of Anubis. There are the new Roman tribes and the decadent Eutruscans who’s golden age is coming to an end. As large as this tale may seem at face value, it is even larger in a mythic sense. It would seem that rather than exploring the downfall of the Etruscans this is a tale exploring the multiple realms of the spiritual world of Etruscan (and Roman, and Egyptian, and Greek) belief. The story starts with an interesting young female character. She is adventurous and privileged. Sadly she spends the rest of the story in a walking fugue state traumatized from being raped by a demon. Then we are introduced to the girl’s mother and a Etruscan lord who in nobility of purpose defy Etruscan custom, a custom specifically revolving around having a good death. We don’t get far before the lord dies, and in his death introduces us to the strength of ancestor worship common among the Etruscans. The tale finally begins to coalesce when Horatrim (like Orpheus) travels to the underworld to rescue his mother. Unfortunately at this stage of the story we have so many points of view that the scenes jump back and forth between events happening on different planes of existence simultaneously. Even the happily ever after ending was rather unsatisfying. In order to tie up all the loose ends there was a little too much convenience and not enough clear consequence. This story really did nothing for me. It wasn’t horrible, but I could have put it down and forgotten about it at any time. Morgan Llywelyn and Michael Scott have done much better with other works. Much of their focus is in the British Isles and Celtic history. Unless you are a huge fan of this style, skip this one and check those out instead.